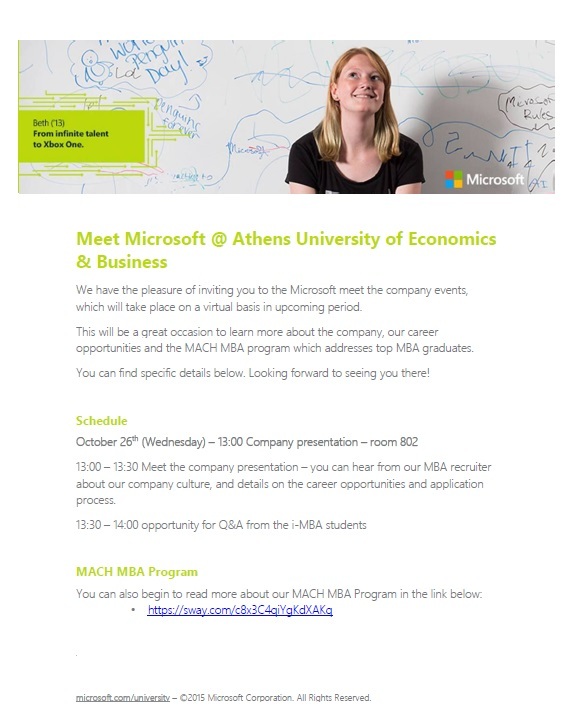 i-MBA Career Office is pleased to announce the organization of a Microsoft Day on Wednesday, October 26th. During the event students of the program will have the opportunity to learn about the company’s culture and career opportunities, hear about the MACH MBA program which addresses top MBA graduates, and pose questions to the company’s representatives. The event will take place on a virtual basis, on Wednesday, October 26th, 13:00 to 14:00 (room 802). For further details, you may contact Ms Ioanna Tranou, i-MBA Career Office Manager (tel. : +30 210 8203669, e-mail: itranou@aueb.gr). We do business in 170 countries and are made up of 114,000 passionate employees dedicated to fulfilling our mission of helping you and your organization achieve more.